I feel like there is a lot more interesting things you could do with this deck. There are a lot of forced combat cards out there that can make sure players are tappedout when she goes to swing: Avatar of Slaughter, Grand Melee, War's Toll, Goblin Diplomats, Total War, Warmonger Hellkite, and Invasion Plans. 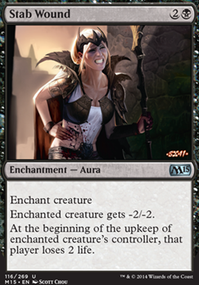 There are also some cool enchantments that can help drain her controller or boost your life without mana: Visions of Brutality, Vampiric Link, Contaminated Bond, and Treacherous Link. Temur Battle Rage, Psychotic Fury, and Uncaged Fury can boost commander damage or save her from death when she's facing another 5/5 blocker. This one might be over budget, but Crawlspace can really help make sure you don't get hit with every other attacking creature on the board. Visions of Brutality, Vampiric Link, Treacherous Link, Disrupt Decorum, Rakdos Signet, Bazaar Trader, Uncaged Fury, Temur Battle Rage, Psychotic Fury, Latulla's Orders, Havoc Festival?, Vandalblast, Everlasting Torment, Geth's Grimoire, Dreadbore. Noticed a Vow in both your main- and sideboard. If you want to explore the whole "enemy voltron" thing, there's also Aggression, Visions of Brutality and especially Treacherous Link. So I saw this deck yesterday and it really hit a soft spot for my love of the card Visions of Brutality, I really like the deck that you have created and the concept you went with fighting. I believe fogs (like you have in your maybe board) would be a good way to defend against a pumped up creature if you went enchantment strategy - which is an alternate route you can focus on with enchantress types but then I would splash white as well. So I will make my suggestions within Golgari and pumps since that is the original creation. By taking out Watcher in the Web for Ulvenwald Tracker then you would really help stress the fighting early in the game. I think Ulvenwald Tracker, Pounce, and Prey Upon are great fight options and you will see a few of those each game if we can get your deck producing the enchantment you want. Hornet Nest is absolutely awesome for generating your Deathtouch creatures on a big hit. I would run 4 of each of the Phyrexian greens instants Mutagenic Growth and Noxious Revival because you can recall your main enchantment you want to use and pump the other creatures or yours depending on what you need to do, but without eating into your early game Mana. 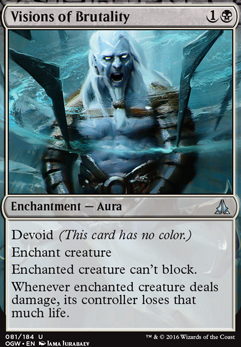 Now I know you are currently running green with a splash for visions, so maybe a few more black support cards for making your deck smoother and use the black Mana to keep your opponent from messing with your combo. Inquisition of Kozilek and Thoughtseize would be great here. This card lends to the idea that you can replace the opponents baddies with something less threatening, but still a target to fight with: Beast Within. Also Deathtouch. What [xyr0s] said about the Basilisk Collar was very true, it is a must have. Maybe one or two of those and then a single Bow of Nylea would prove helpful. I like the idea of Stuffy Doll in here, although I hate building around him because of his Mana cost. 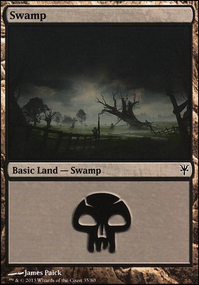 So aside from researching some better modern land - I would check some of the mtgtop8 stuff and look at what land they use in Golgari for hints - try some of these cards out and remember that no card is perfect and you should be ready to pull something out when it does not provide enough utility. Promise yourself to change one thing about the deck each time with your maybe board. It is not permanent, but learn what each cards does and what it excels at. That is the only way you will know your deck inside and out. This is a great idea and start to an interesting deck that can be played in the modern environment, it will just take a lot of time cutting and cleaning it up. 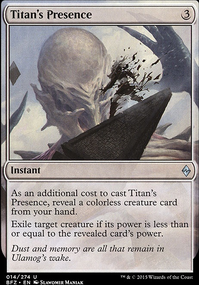 As an afterthought, Sorin Markov is tempting, but for a Walker that costs 6 and his first usable abilitiy is equivalent to a Sorin's Thirst, you could do better. His -3, you honestly should have your opponent below 10 by turn 6, so that ability is basically moot. Controlling your opponent's turn is cool, if the game is still going. 2x Captivating Vampire would sweeten that boardstate and gain you some interesting pets along the way. More stuff to consider! Play on! So since it cam out Nahiri's Wrath was always at the back of my mind. And i recently stumbled upon some nice cards that compliment it perfectly Ragged Veins (with flash! 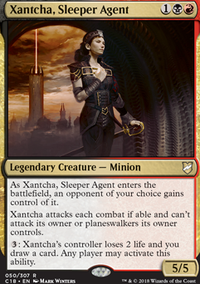 ), Visions of Brutality & Spiteful Shadows - all of which are a lot better than Boros Reckoner or Spitemare in this role. Of course a short search later i quickly realized that i am not the first to come up with the idea. And quickly found out, that no one made a serious attempt to make such a deck work. The problem of creatureless decks can be solved by Forbidden Orchard, and black has plenty of discard for the sideboard, to fight counterspells. Does this idea seem viable?